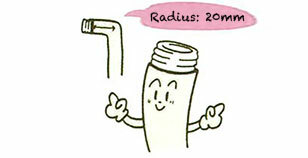 Today’s diverse house-building techniques require different types of gas piping. 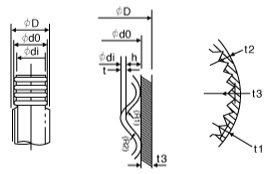 KFT and KFP are gas piping materials that fit new building techniques. 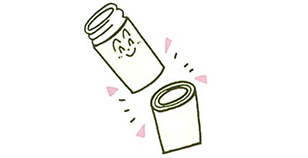 They are easy to bend, but hard to break, enabling easy installation. Time-consuming indoor piping work now becomes fast and effective. 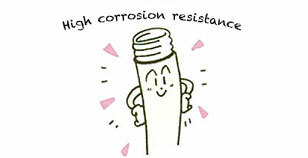 Stainless steel ensures high corrosion resistance. Flexible pipes are made of stainless steel, providing excellent durability and anti-corrosiveness. Soft PVC coating eliminates the need for additional coatings, giving a beautiful appearance. Much easier to install compared with installations using galvanized steel gas pipes (SGPs). Not needing elbows or T-fittings, this pipe is easy to bend by hand according to the piping route, saving time and money. 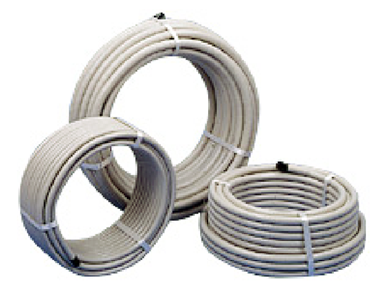 Flexible pipe’s bending radius is only about 20 mm (10A and 15A), saving space and enabling flexible installation in narrow spaces, for diagonal piping, and complex routes. Availability of various applicable parts, such as easy-to-install dedicated fittings, branch headers, and branch T-fittings, enables applications for almost all working and installation requirements. 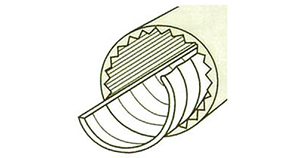 Quick cut is available by using a dedicated pipe cutter. Precise on-site cutting is not needed because slightly long pipes can be flexibly adjusted to the site, substantially reducing work hours. 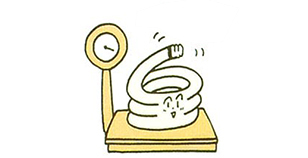 Flexible pipe is lightweight; about 8 kg per 60 m length (10A one roll). It is easy to carry and install. 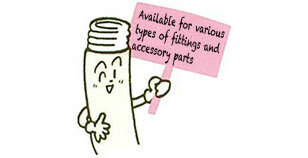 * KFP25A only is produced in a roll length of 30 m. A roll with 25A x 60 m can be produced on order.